“I should have put my shades on today ‘cos the future’s looking so bright!” – An interview with Maizie Williams of Boney M.
You are at:Home»Features»“I should have put my shades on today ‘cos the future’s looking so bright!” – An interview with Maizie Williams of Boney M.
Hurriedly thrust into the press area of Common People, I’m drafting questions on my phone for a music legend in the few minutes I have to prepare. It’s a situation that’s happened more times than I care to admit (as I’m sure many journalists can relate), but it somehow adds to the buzz, the excitement. I’m interviewing the Boney M. What do you ask the Boney M.? Well, first you have to work out which member you’re talking to. That’s no mean feat, considering the Euro-Caribbean band’s long and complex history. At one point, multiple Boney Ms simultaneously toured the world, each performing classics such as ‘Rasputin’, ‘Daddy Cool’ and ‘Sunny’ on every continent. 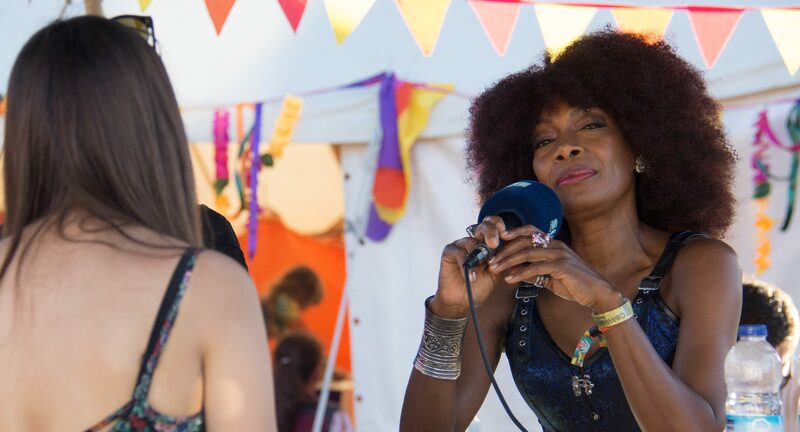 Lavishing in the backstage sun, we find the effortlessly charming Maizie Williams – the band’s only original member – fresh from performing those iconic hits to an adoring Southampton crowd. We touch upon on Boney M.’s monumental legacy, a success story that’s played out over half a decade. “We sold over 150 million records; it’s a nice feeling to know that we achieved that. When we started off we didn’t think for a moment we’d get to where we are today. It was just something we enjoyed doing – we enjoyed singing, we enjoyed performing – and low and behold, we woke up one day and Boney M. was charting major! We were having Number 1 hits. Isn’t that wonderful?” Maizie twinkles with a charming humility, reflected in her attitude to her two student interviewers. She seems genuinely interested in the quirky SUSU media groups that have come together to chat with her under unusual circumstances. Talk turns to the multicultural blend that sets Boney M. apart from the crowd. The original line-up spanned from Germany to the Caribbean, with Maizie herself hailing from Monserrat. “I love all forms of music. Music is not just one particular type of music, it’s worldwide – it’s a cultural thing! Wherever we travel to around the world, we just enjoy the music of that particular culture, and it’s wonderful. I love all types of music – I love jazz, I like blues, I like pop, I love reggae – I love all kinds of music! Italian, French – if it’s good, I like it! Bring it on and I’ll listen to it.” Her boundless positivity speaks volumes for the enduring nature of her career. We finish with a mean question. Having played Common People Oxford the previous day, I tease out whether she preferred there or Southampton. “They’re both good!” she exclaims, laughing. “I’m not going to put myself on the line by saying one is better than the other. I have to say people react the same to music wherever.” Her manager interjects to say that Oxford *might* have been marginally better, which feels like a suitable point to end the interview. Maizie, ever the diplomat, swerves the point and thanks us for our time. The pleasure was all ours. Check out our review of ‘Disco Day’ at Common People, and keep your eyes peeled for the radio and TV versions of this interview on Surge Radio and SUSUtv.